Home » Football » Forget Tanking, the Jets are back!!! Forget Tanking, the Jets are back!!! The Jets destroyed the Buffalo Bills on Thursday night and the game was never in doubt. The Bills came in as the third best team in the AFC, but looked like one of the worst teams in the NFL thanks to the Jets defense which had its best game of the season. The Jets go into the mini bye with a lot of momentum and have some winnable games coming up which can help them turn their season into something positive. It has become a weekly tradition that the Jets are exceptionally good on offense in the first quarter. They jumped out to an early 7-0 lead, but the Bills scored to tie the game quickly. The Jets defense had a great first drive to shut down the Bills and proved that the drive that resulted in a touchdown drive was just one bad set of plays. The Jets defense came alive in the second quarter and never took their foot off the gas until the last few minutes of the fourth quarter. The defense shut down Tyrod Taylor and had five sacks in just the first half, the defensive line had their best game of the season and was a destructing force in the trenches. Darron Lee had one of his best games in his young NFL career, him and Mohammad Wilkerson have been playing great in the last two weeks after having a really bad start to the season. 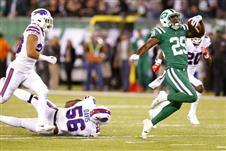 The Jets shut down the running game also and were forcing turnovers to give great field position to the offense. The Bills came back and scored some points in the fourth quarter but the result was never in doubt at that point. The defense is the main reason that the Jets won this game and it has to keep playing this way if the Jets want to do anything with this season. The offense was really good in this game and for the first time in a couple of weeks was actually functional in the second half. The running game was going strong in the trenches and was the driving force that took some pressure of the receivers and Josh McCown as they eventually got going and took the game out of reach for the Bills. The offense especially the running game led by Bilal Powell has to maintain this for the rest of the season. Even though the final score was just a two touchdown difference, the Jets basically won this game by thirty points if they had not given up in the fourth quarter The Jets had their first true complete game in a couple of years and maybe this is a sign of things to come for the rest of the season. I had said last week that if the Jets lose this game, they should think about making a change at quarterback, but I have completely changed my mind. I think the Jets should stick with McCown as he gives them the best chance to win for the rest of the season and neither of young quarterbacks on the roster look like they are going to pan out. The Jets have a mini bye coming up after playing on Thursday and their next game is not till the 12th against the Bucs in Tampa Bay. The Jets can easily win that game to get back to .500 and start dreaming big again. There are a lot of average teams in the NFL, who just have good records because they are beating up on other average teams. The Jets have the roster that if they play a complete game than they can beat almost any time in the NFL. The Tank is totally off for this season and even though that hurts their long term future, I do not think they have the capability to make any right decisions if they did in fact embrace the Tank.